Last One, Laptop shown in picture is not included. OS Software can be Downloaded from Brother website, Does not include hard copy of OS software. Works best as a second head connected to an existing B1201 machine complete with your own OS programmed laptop. 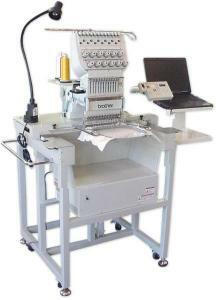 The BE-1201B-AC single-head embroidery machines are specifically designed for sewing patterns. The editing function has been simplified to cover only those functions which you use most in order to make overall operation easier. All functions can be input from a single control panel, so that operations are easy to understand and simple to carry out. You can embroider a pattern that has already been input simply by selecting the desired pattern from a maximum of 45 patterns. Brother’s unique wick oiling system significantly reduces machine maintenance downtime. Oil is poured into a conveniently located reservoir on the machine, and a wick that is threaded through the internal workings of the sewing head delivers oil when and where it is needed, eliminating the time-consuming task of oiling numerous hard-to-reach locations. Developed by Brother, the cam-driven presser foot allows the machine to run faster and quieter. The precise movement of the cam reacts faster than the previous spring-loaded technology and reduces the noisy pounding of the presser foot on the throat plate. The single presser foot also facilitates increased machine speed and less maintenance. Maximize system productivity with fewer bobbin changes with the larger capacity, jumbo “M” style bobbins. Brother perfected the performance of the jumbo bobbin by designing the cams and gears inside the sewing head to accommodate the longer rotation of the larger bobbin. Start sewing faster with the simple, logical commands found on the control panel. For example, the hoop feed button moves the pantograph out from under the needles for trouble-free applique placement and easier loading and unloading of hoops. Resume stitching a partially complete design after the machine has been turned off, unplugged, or even after power failure. Shut the machine off to work with a customer, go home for the evening, or even move the machine across town and never lose a stitch or go off registration — another Brother first. Brother Phone and Email Support on Industrial Embroidery Machines, including B1201 Brother phone and email upport is being driven by the information at this link. This is the best way is to pass on information to the end user. The OS operating software is not on any public domain any more. Must specify brand, model and needle system of your commercial embroidery machine. Must specify brand, model and needle system number for your commercial industrial multi needle embroidery machine (not home machines). Must specify brand, model and needle system number for your commercial embroidery machine.